Nanny Poppinz is A 27/40 Company. 27 Years Old and 40 Thousand Happy Families!! The Best Professional Agency & Services for Your Needs! Nanny Poppinz of Coral Gables and Miami-Dade County is the leading provider of Nanny childcare services in South Florida. Our goal is to recruit, evaluate, and refer only the finest quality Nanny to each of our families. It is thrilling to offer parents another childcare option that they may not have considered before. We understand that childcare needs do not just happen from 9 AM to 5 PM; thus, we are the only Nanny agency in Coral Gables Miami area to offer 24 hours a day, 7 days a week service including holidays. We will match the unique needs and expectations of your family with a qualified Nanny before scheduling interviews with no upfront cost or fees. Once a confirmed match is made you will be charged a referral fee. Our intent is to give you peace of mind with your Nanny childcare selection so you can work, travel, entertain, or just have fun while your children are receiving the quality, loving childcare they deserve. Nanny Poppinz system of matching families to a Nanny is unique -- "Created By Moms For Moms" - where we know what families want. Each Nanny is a proud to be part of our agency, where we provide professional training and support to constantly improve and enhance their childcare skills. Careful evaluation of individual family requirements, then referring qualified Nannies to meet each specific family's child care needs coupled with the best Nanny child care service in the Coral Gables and Miami, Florida area. Experienced Nannies with First Aid CPR (or be certified within 30 days of hire for permanent referrals) and First Aid training. 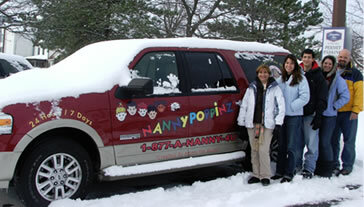 They are personally interviewed and background checked at Nanny Poppinz to be sure they meet our stringent requirements. We believe we have amazing Nannies. That's why we have no upfront cost until after the families interview selected Nannies. When a confirmed match with a Nanny is made only then will a referral fee be charged. Loving, attentive care for your children from reliable Nannies who you can trust. Screening and recruitment of the most qualified and experienced Nannies suitable for a broad range of childcare and domestic needs - you are in the company of other highly qualified professionals. Free CPR and First Aid Training for each Nanny so they can handle emergency situations. Comprehensive educational resources for our Nannies to consistently improve their childcare skills, such as communicating with children and parents, hygiene, nutrition, pediatric illnesses, keeping children safe and creative play. Nanny Poppinz of Coral Gables and Miami - Dade County is a privately-owned and independent agency owned by Roxana Rodriguez. "I opened a Nanny Poppinz franchise for my children. It is a home-based business that works with children. The agency is perfect in that it encompasses their interests. My children will be operating the agency. Their names are Elaine, Jessica, and Juan-Carlos Rodriguez. We promise that each and every family will be treated like our own." Please give us a call at (786) 245-7755 and let us prove our passion for providing you with quality childcare in Coral Gables and South Florida. We are fully committed to meeting the unique needs of our clients and our Nannies 100% of the time and provide only the best nanny services in Florida. We look forward to working closely with you to find the perfect Nanny in Coral Gables for your children. For Nanny CPR class information please call 305-305-1219. For information on how to become a Nanny Poppinz Nanny and to schedule an interview please call us a 305-305-1219. The interviews will be conducted from 10 AM - 1 PM. 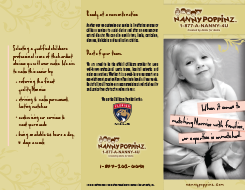 Nanny Poppinz proudly offers Nanny referral fee discounts to Military and Law Enforcement families.